Category Archives: Linux, PostgreSQL, etc. Notes about using Linux, MySQL, PostgreSQL and other free software, no matter if it’s open sourced or not. We’re slowly migrating our DB servers to Oracle Linux 7 and at the same time we’ll upgrade ArcServe 16/16.5 backup software to version 17.5. Unfortunately, the information that we found on the web regarding support for Oracle Linux 7.x is not consistent with the readme document that comes with the media. And below, you’ll see what we got during agent installation. We believe that this inconsistency is due to the poor installation script maintenance (apparently updated in 2015). The installation of the agent 17.5 (+ mandatory patch 802!) on Oracle Linux 7.4 was a breeze . This distribution of Linux is not certified by Arcserve Backup. If you run it, you may experience problems. Note: Client Agent will be installed automatically if Data Mover is selected. Download patch P00000802.zip from ArcServe support. Shutting down Arcserve Backup Universal Agent process...Down. 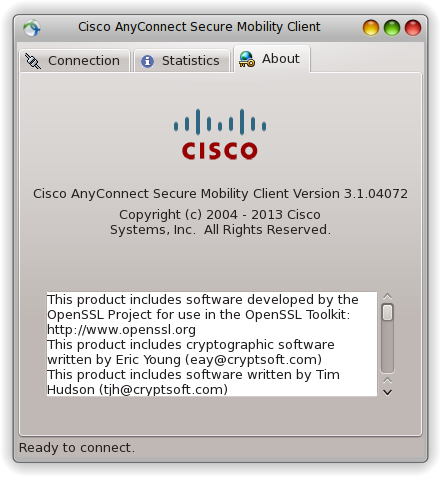 This is a short memo about installation of “Cisco AnyConnect Secure Mobility Client 3.1” on my Fedora 20 (KDE) powered laptop. Although Fedora is officially not supported I didn’t find any glitches so far running Cisco vpn client on my laptop. $ sudo yum install pangox-compat.x86_64  // prerequisite! // Download and replace yum repository file with the new one! That’s it. Don’t forget to set Enabled=1 in ol6_UEKR3 section, unless you don’t want to upgrade UEK2 kernel to version UEK3. Cannot identify your Linux distribution or it is not yet supported. running an operating system that is not currently supported by ARCserve. To check the latest list of supported operating systems, go to ca.com/support. If you continue, be aware that unexpected results could occur. FORTH ABOVE AND PROCEED WITH THE INSTALLATION PROCESS. ENTER NO (N) TO HALT THE INSTALLATION PROCESS. drwxr-xr-x  4 root root   35 Dec 31 09:42 .
drwxr-xr-x. 6 root root   62 Dec 31 09:42 ..